The Doge's Palace and St Mark's Basilica tour meets at 10.45 am every day. There is a morning tour every day. We are comparing St Mark's Basilica And Doge's Palace Skip line Tour Prices from leading ticket suppliers and Try to find you Cheap tickets prices on the market. This 2-hour walking tour takes you the 2 of the most significant buildings in the whole of Venice. The Doge's palace was once the seat of Venetian power, where a council of Dukes and wealthy merchants would sit to debate the future of the Venetian empire. After meeting your guide in Piazza San Marco you'll then be led to the Doge's grand, open courtyard and up into the wide and richly decorated rooms. Let your guide lead you down dark stone staircases to the same cold, damp prison cells that the likes of Giacomo Casanova were incarcerated. Then climb to the Bridge of Sighs, where many prisoners attempted their break for freedom. You'll then return to St Mark's square and pay a visit to St Mark's Basilica, not just one of the grandest but also among the most unique Catholic cathedrals in all of Europe. Walk along the undulating marble floor under a ceiling of golden tiles and mosaics. Meanwhile, your guide will teach you the history, both facts and myths, and show you to the Pala D'Oro, decorated with Byzantine artworks and collections of precious gems. Your tour will end the entrance to St Mark's Cathedral from where you could head up to the cathedrals terrace (not included) or grab a bite to eat on the Piazza. Ideal for people with a limited amount of time in Venice. Visiting both of these attractions with a guided tour will be convenient and save you time. Recommended for people interested in architecture, art, religion and history, you guide will cover all of these topics. Your Experience With St Mark's Basilica And Doge's Palace Skip line Tour ? 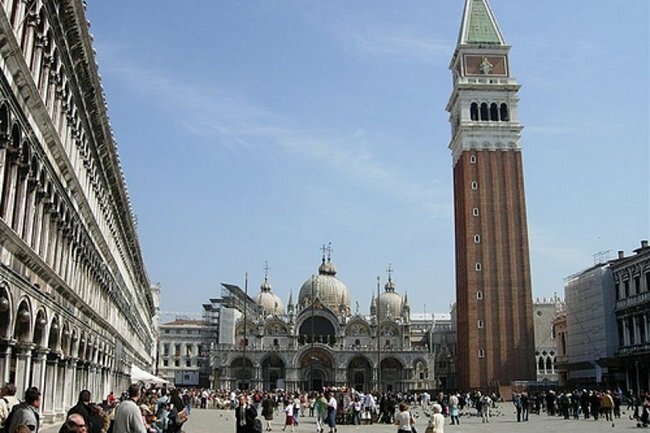 Combine Venice's 2 top attractions with a 2 hour guided walking tour of St. Mark's Basilica and the Royal Doge's Palace. Learn the myths and legends of these iconic buildings from a knowledgeable local guide. Marvel at the magnificent golden ceiling inside St. Mark's Basilica and take your holiday snaps on the Bridge of Sighs. What St Mark's Basilica And Doge's Palace Skip line Tour Includes? Professional English, Italian, Spanish, French or German speaking tour guide. Skip the Line entrance for the Doge's Palace and St Mark's Basilica including access to the Pala D'Oro. Tips and recommendations on how to spend your remaining time in the city. This tour is available in multiple languages, check in advance what time a tour in you preferred language is available. Take a peek through the tiny peepholes on the bridge of sighs. Travelers Reviews about St Mark's Basilica And Doge's Palace Skip line Tour ? Travellers have left hundreds of reviews for this tour and on both Get Your Guide and TripAdvisor the average customer rating is 4.5 out of 5. Viator customers have left a full 5 out of 5-stars for the experience. Overall travellers say that the tour guides on this tour make the experience very fun. Reviews often say that they learn a lot too. The main complaint is that these attractions are very busy, however comments imply that the visit is still worthwhile. Cancellation policies depend on individual supplier, full refunds may be possible up to 24 hours in advance. Shoulders and knees must be covered to enter the cathedral. There may be a short wait and entrances for security checks. Groups are a maximum of 35 people. Meeting Point: Under the clock tower on San Marco Square.